Deli A Go Go- A must go for your foodie treats! When I was asked to review Deli a GoGo I was very excited as I love my food and I’m always happy to try somewhere new. 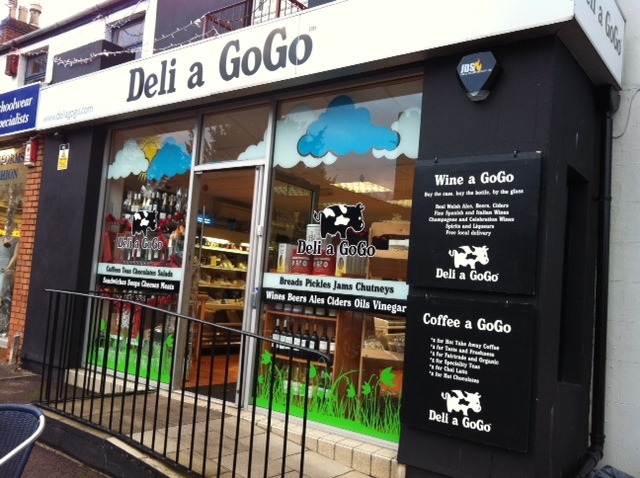 Deli a GoGo is situated on the busy Whitchurch High Street by the crossroads. When you enter you firstly come to the delicatessen which is full of a wide variety of tasty treats. They have a selection of olives, sun dried tomatoes and stuffed peppers which you can help yourself to or grab one of the pre packed boxes. They have an even bigger selection of cheeses both from Wales and around the world. The staff are extremely helpful and are happy to cut the cheese to a smaller size if there isn’t any available the size you want. If olives and cheese aren’t your thing, they also have meats, wines, oils, homemade chutney, sandwiches, cakes and plenty of other food for sale. As I visited Deli a GoGo the week before Christmas they also had food hampers for sale that looked like they would be a welcome gift to any food lover. I would be really happy to unwrap one as a gift! When you walk through the delicatessen you come to the café. The café is a small cosy area with simple white painted walls and wooden tables and chairs. It’s quite a small seating area and space is tight so it isn’t ideal if you have a puchchair as I found out. There wasn’t much space to leave the pushchair where it wasn’t in everyone’s way so if you have a baby, you should bear this in mind. It’s a nice place to meet for a coffee as they have a huge selection of hot drinks available. I went for the Baileys latte and Mrs V chose the chocolate chai latte. We both agreed our drinks were delicious and creamy and a good price. They were very generous with the Baileys in my latte and both drinks came nicely presented with an Amoretti biscuit. We couldn’t decide what to have for lunch so we went for the dish of the day – chargrilled vegetable pie and a dolcelatte, walnut and honey salad and shared them both. The pie was full of courgettes, aubergines, peppers, tomatoes and came with a salad garnish. 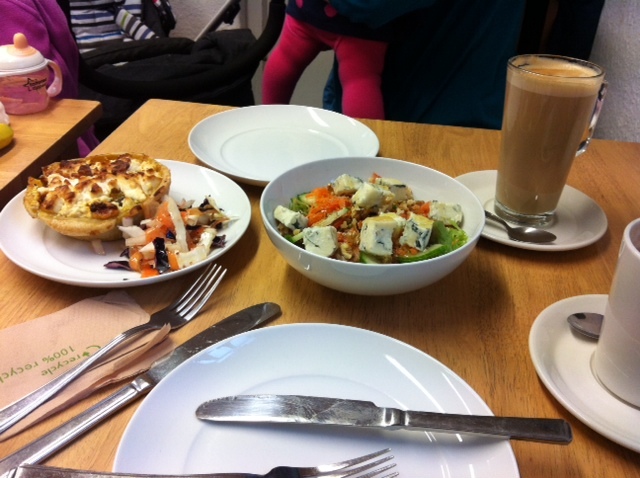 The dolcelatte, walnut and honey salad was very tasty. The prices were extremely reasonable with sandwiches even cheaper than some of the pre packed ones you get at supermarkets. I’m a big fan of independent shops and eateries and Deli a GoGo is a winner in my book. If you’ve got time to stop and eat great, but if not, treat yourself to some cheese and wine to enjoy at home. 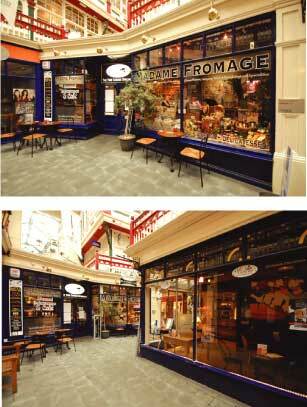 Madame Fromage is a lovely little cheese shop and deli in Duke Street Arcade in Cardiff town centre. Duke Street Arcade is a quaint little place full of unusual, quirky, (possibly also a little pretentious) shops and Madame Fromage is a perfect fit. Madame Fromage sells cheese and deli items such as delicious chutneys and gift hampers, hand-made cakes and other lovely things. They sell items made locally which also appeals to me. The best thing about this place is that it is also a little cafe. Next to the shop section, is a little area with tables and chairs and a little kitchen area. Last weekend a friend and I popped in for a coffee when it was raining and ended up staying for ages. It is just such a nice place. I had a spiced coffee with cream which was very tasty. This is also a wonderful place to come for lunch. The shop has a separate section across the arcade where you can eat if the main shop is full. I’ve been here before and the food is just lovely. They do great soups with chunky bread and other nice warm lunches. Perfect when it’s raining outside. This place isn’t cheap but I think it’s reasonable for what you get. It’s so much nicer than sitting in your average sandwich shop and it’s still much cheaper than say Starbucks if you’re having lunch and a coffee.